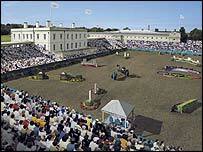 Greenwich Park is an obvious choice to stage events at a London 2012 Olympics and Paralympics. London's oldest Royal Park is just a few miles to the south of the planned core Olympic zone in the Lower Lea Valley, and the fact it houses the Greenwich Old Royal Observatory gives it added historical appeal. The Observatory, which stands at zero longitude and is seen as the historical home of time, would be a perfect backdrop for television. And the park, where the London Marathon gets under way every year, has been pencilled in for equestrian events and the riding and running disciplines of the modern pentathlon.